MyComputerCareer.com recently gained academic accreditation through ACCET, the Accrediting Council for Continuing Education and Training. This is a significant milestone in the growth and development of the institution. Accreditation is important to any school but particularly so, to private schools like MyComputerCareer. It certifies to the public that the institution meets or exceeds reasonable standards of academic excellence, ethics and value, and delivers on its promises. Every aspect of the institution is thoroughly examined from its financial structure and pricing to admissions policies; advertising claims to academic performance and job placement results. Interestingly, accreditation standards for private schools are significantly higher than for public colleges and universities. Accreditation is also a prerequisite for federal loans and loan guarantees like those offered through Title IV and the GI Bill®. Accreditation board members from ACCET consisting of representatives from peer institutions visited the MyComputerCareer campuses earlier this year to evaluate the school against the rigorous professional standards set by the Council. 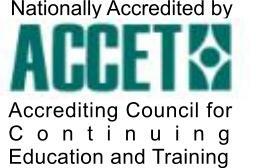 ACCET is recognized by the US Department of Education as an official accrediting body. On September 1, 2011, MyComputerCareer.com was officially awarded the long-sought-for accreditation.